Granit Xhaka was shown a red card but Theo Walcott’s brace laid the foundations for Swansea City’s defeat. Arsenal forward Theo Walcott celebrates scoring against Swansea City. THEO WALCOTT STRUCK twice as 10-man Arsenal moved level with Premier League leaders Manchester City and consigned Bob Bradley to an enthralling 3-2 defeat in his first match in charge of Swansea City. 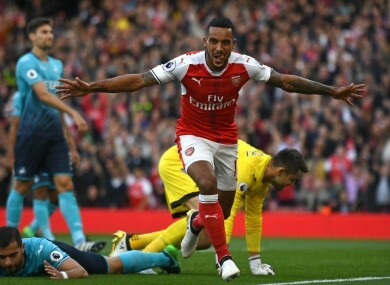 Some slack defending from Swansea was punished by Walcott twice in the first half at the Emirates Stadium, taking his tally to six goals in his last five Arsenal appearances in all competitions. However, Gylfi Sigurdsson, leading the line with Bradley not including a recognised striker in his first line-up, marked his 100th appearance for the club with an excellent finish to give the visitors hope ahead of the second half. Mesut Ozil, celebrating his 28th birthday, then slammed a volley beyond former Arsenal goalkeeper Lukasz Fabianski, but second-half Swansea substitute Borja Baston pegged back the hosts with his first goal for the club. The comfortable grip Arsene Wenger’s men had on the game began to vanish when Granit Xhaka was shown a straight red card — his fourth dismissal since the start of last season and more than any other player in the top five European leagues — for lunging in on Modou Barrow with 20 minutes remaining. However, Arsenal hung on to end a run of four top-flight home matches against Swansea without a win and join City at the summit on 19 points from eight games. Bradley’s team struggled to keep the ball in the early exchanges and Shkodran Mustafi almost made the breakthrough for Arsenal with a near-post header from Ozil’s corner that struck the crossbar. But Arsenal made the breakthrough in the 26th minute. Hector Bellerin headed Alexis Sanchez’s looped pass across goal and Walcott stole in ahead of the dawdling Jordi Amat to guide his shot inside the near post. Sanchez and Bellerin had chances to extend the lead, but it was Walcott who doubled his and Arsenal’s tally. Jack Cork’s poor headed clearance from a corner fell straight at the feet of the England international, who drilled home on the spin. However, Xhaka gifted Swansea a route back into the game when he stumbled during a stepover and Sigurdsson pounced to curl a beautiful effort into the top-left corner. Amat, who earlier appeared to catch Walcott in the face with a high arm, then spurned a chance to equalise when he headed straight at Petr Cech in first-half stoppage time. Walcott fired a chance to complete his hat-trick straight at Fabianski, but Ozil restored Arsenal’s two-goal cushion with a thumping volley from inside the six-yard box. An attacking switch from Bradley that saw Borja replace Leon Britton paid dividends in the 66th minute when the Spaniard slotted home off a brilliant cutback from Barrow. The game looked in danger of slipping away from Arsenal when Xhaka was shown a straight red card for a reckless tackle from behind on Barrow. Barrow, who later hobbled off and was replaced by Angel Rangel, sent a header straight at Cech before Sigurdsson rifled over with 10 minutes remaining. Walcott came agonisingly close to his third but his low shot from the edge of the area hit the inside of the post and came out. The forward spurned another chance to complete the hat-trick when he turned substitute Alex Oxlade-Chamberlain’s pass onto the bar in the fourth minute of stoppage time, but Arsenal held on to take all three points. Email “Walcott's double helps Arsenal to win a 5-goal thriller and draw level with Man City”. Feedback on “Walcott's double helps Arsenal to win a 5-goal thriller and draw level with Man City”.